But, the “Internet” is not some willful thing in of itself. The Internet is the aggregate of countless acts of human volition at every scale from protocol, to platform, to user. Insofar as “the Internet” speaks to us through anything, it speaks through the words and deeds and values of people, not machines. The ecosystem of our technology, and the ever shifting arena of freedoms within it, depends on those human choices, and not some magical inherent quality of the devices we use. The only question is: what kind of Internet do we want? For us, Ilya and his work embodied those choices — more accurately really those values — upon which the Internet frantically draws on in its finest moments. Open. Dynamic. Collaborative. We mourn the loss of an enormously generous friend, a brilliant collaborator, and an irreplaceable, wonderful force in strengthening the creative life of the web. We’ll miss you. You can download and read the full article (open access) in PDF format from the IJOC website: http://ijoc.org/ojs/index.php/ijoc/article/view/1246/613. 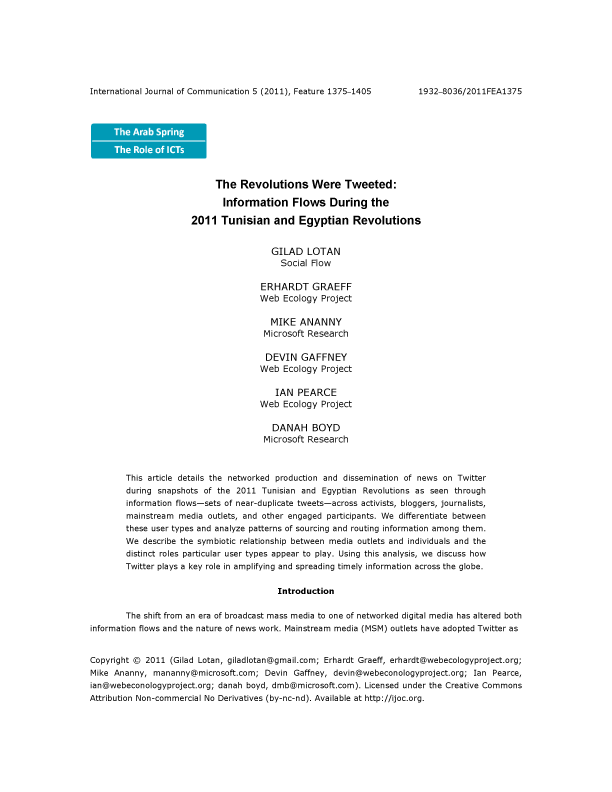 Lead author Gilad Lotan also produced an online data navigator to accompany the article: http://www.danah.org/projects/IJOC-ArabSpring/. Team C’s bot works on a clever interlocking system of follows and a pre-stored databases of generic responses/questioning to stimulate target activity. Given performance on the game, we’ve clocked the social horsepower of this bot in at an average of ~8 follows/day (f/d), and ~14 responses/day (r/d). 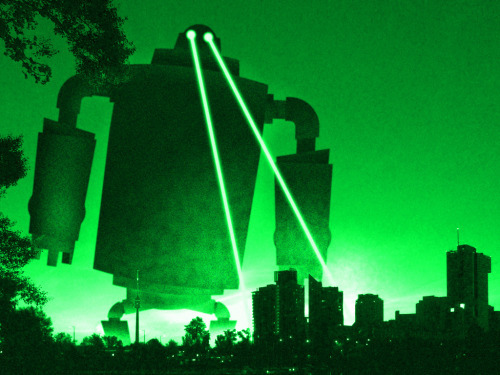 Team B’s bot uses a copy-and-parrot structure to fill its content, and also has some neat attack countermeasures built into its codebase. Our measured performance shows about ~7 f/d, ~2 r/d on this one. Team C’s bot has an alternative and very interesting following structure built into its logic. Over the course of the game, Team A was the winner on automation of raw connection building. ~9 f/d, ~1 r/d. Enjoy! All code from the competition has been licensed under the terms of the permissive MIT License. So feel free to tweak and share as you wish – give a holler if we can be of help on anything! contact@webecologyproject.org. 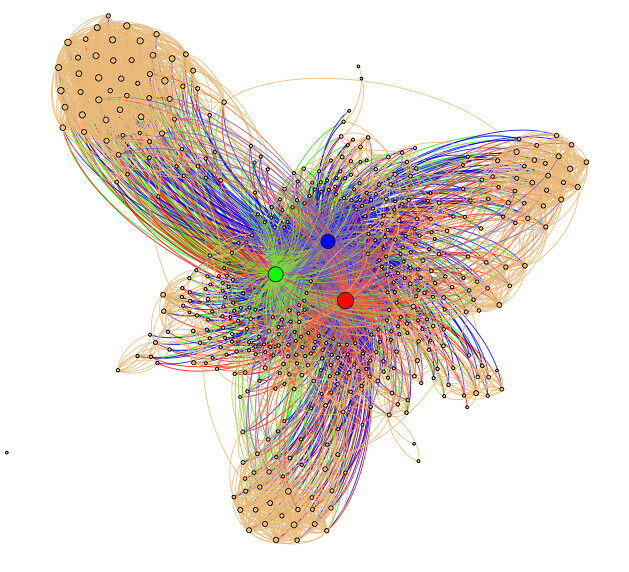 And the obligatory network graph. It appears that Team B’s dastardly counterstrikes to undermine the other teams are having some effect, as Team A’s growth has slowed somewhat in the last 24-48 hours. However, these counter-strategies seem to have had less of an effect on Team C, as they have enjoyed the largest single-day growth seen yet in the course of the game — which has been driven almost entirely by responses from the targets. Hey readers! Things have been absolutely nuts here at socialbots mission control, but wanted to take a second to drop the latest update on how the competition is going. As we wrote earlier, Monday officially commenced the second round of the competition. Over the weekend, the teams had a chance to edit their bots based on their performance in Round One, and launch additional bots. Team A and C updated their code, and Team B additionally became a swarm bot (a lead bot with supporting bots). Both Team B and C have deployed new architectures for their bots, trying to maximize their social response from the target network and make their bots more proactive in responding to the targets. This has led to a gigantic growth in points — although Team A currently now outpaces Team C in terms of raw follow-backs (117 v. 107), we’re seeing a huge point lead start to cleave out from bots getting optimized to elicit responses (Team C currently has logged 86 responses, with Team A only with 9). Team B’s approach to appropriate other user content in fueling interactions between bot and target has been relatively less successful, with only 9 responses racked up so far. However, optimizations to their connection building mechanism have been significantly more successful, showing a 500% increase in points against round one in the three days since the second round began. As per usual — the full network graph, now color coated for more easy determination of what’s going on. We’re playing around with some more visualization to make it easier to see how much social “territory” the teams have captured. Team A continues its strong rate of growth into late Round 1, edging in to close the early lead Team C has been enjoying for the majority of the game. At this point, the point difference between Team A and Team C turns largely on the number of @ replies that the bots have received, with Team C having the slight edge at the moment. 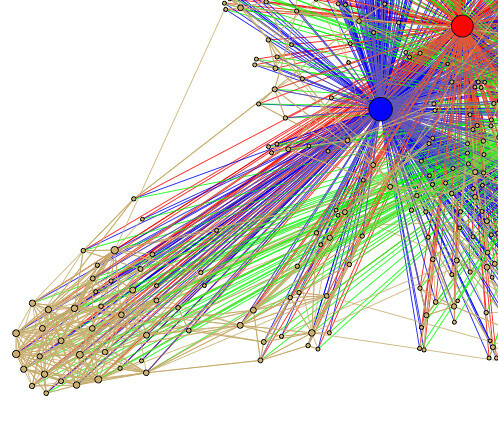 Here’s the latest network graph showing the state of the battlefield. As mentioned in our last post, this Sunday is “Tweak Day” — essentially a 24-hour period where teams will get a chance to freely update their bots, launch new bots, and (potentially) switch their lead bot. No points will be scored during this time, though we’ll be reporting on the latest score going into Round 2 next week. Hey readers! Sorry about the delay in posting, been nuts here at Socialbots 2011 mission control. Here’s what’s been happening for the past two days. Generally, we’re seeing a strong surge in points from Team A — driven almost entirely on points gained through follower acquisition. As per usual, you can see the current network graph here, showing all three team bots becoming pretty deeply embedded within the target battlefield. At this point in the game we’re running towards the end of Round One. This Sunday, teams will have a chance to tweak the code running on their bots, launch/decommission bots, and implement strategies to aid themselves (or hinder their opponents) before the start of Round Two on Monday next week. This is significant, since prior to the launch of the competition, teams did not know the identities of the other bots in the battlefield. Having had a week to observe their performance and the behavior of the other team’s lead bots, they’ll be able to adapt strategies accordingly. We’re hoping that we’ll see numerous sparks fly. Keep your eyes on this space!